Oskar Kokoschka was the son of an impoverished craftsman, and, like his eventual mentor Gustav Klimt, he attended Vienna's Kunstgewerbeschule (School of Applied Art). As a compromise with his father (who insisted that his son enter a financially secure profession), Kokoschka agreed to enroll in the school's teacher-training program. However, after completing a two-year introductory course that centered upon life drawing and anatomy, he in 1906 applied to the painting division, where he studied first with Carl Otto Czeschka and then with Berthold Löffler, an artist who (like most of the teachers at the school) had strong ties to the Wiener Werkstätte. Through Löffler, Kokoschka received his first paying commissions. He designed a series of postcards for the Werkstätte and, toward the end of 1907, was entrusted with a more substantial (and costly) project: the creation of an entire illustrated children's book. Kokoschka's book, Die träumenden Knaben (The Dreaming Youths), was published by the Wiener Werkstätte on the occasion of the 1908 Kunstschau, a special exhibition that was part of a series of events celebrating Emperor Franz Josef's 50th jubilee. Like much of Kokoschka's work from this period, the illustrations were executed in the bright, decorative style then in vogue at the Wiener Werkstätte, but the text (also written by Kokoschka) revealed a markedly different approach. Kokoschka's abandonment of any overriding superstructure linking word and image, in tandem with his bizarre, proto-Expressionistic prose poem, rocketed the young artist to the forefront of the then-nascent Viennese avant garde. 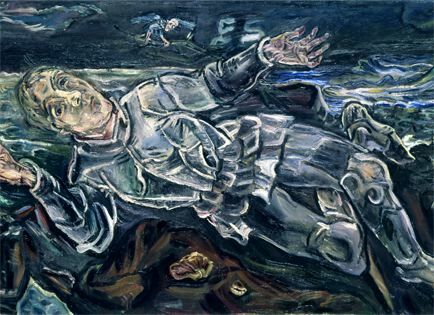 Kokoschka's apotheosis was further advanced by his contributions to the Kunstschau itself, where he exhibited alongside ten other members of Löffler's class. His participation in the exhibition was sponsored by no less a luminary than Klimt, who identified him as "the greatest talent of the younger generation." Kokoschka was clearly among the stars of the show, the only one of his classmates to be singled out for special mention. All his work, including a series of large tapestry designs, was sold (much of it to the Wiener Werkstätte or affiliated artists) on the opening day. In later years, Kokoschka bemoaned the hostile response of the press, but in truth the reviews were largely favorable and at worst ironic. The noted critic Ludwig Hevesi bestowed upon him the not entirely unflattering title "Oberwildling" (Fauve Princeling) and wrote: "Kokoschka will be thrown shredded to the winds--but it will do him and the air good." Indeed, the artist willingly became a self-styled "Spieserschreck" (terror of the middle-class), cultivating an image that combined revolutionary fervor with professional opportunism. It is difficult to determine just how advanced--and hence shocking--Kokoschka's 1908 Kunstschau exhibits really were, but insofar as his contributions can today be reconstructed, it would seem that they still fully reflected the ornamentalism of the Wiener Werkstätte. Nevertheless, these works (like the illustrations for Die träumenden Knaben) must have evidenced an abrasive undercurrent that hinted at an incipient change in direction. Thus, the iconoclastic architect, Adolf Loos decided to take Kokoschka under his wing and wean him from the Wiener Werkstätte (which Loos despised) by offering to get him portrait commissions. It was through Loos's patronage that, in 1908 or 1909, Kokoschka began to paint seriously. Kokoschka's initial portraits were tangible manifestations of Loos's dictates regarding the eradication of ornamental facade and artificial structure. The fledgling painter extracted the suppressed sexuality and nervous tension from the Wiener Werkstätte's decorative veneer, and wedded to this the blunt primitivism of tribal art. He made not even a token bow to the vanity of his sitters, but went straight to the heart and soul. Kokoschka seems to have been guided purely by raw instinct. Forms were not built up in the conventional manner, but rather scraped bare, so that in places the canvas itself showed through; at times he used his nails to incise lines into the wet paint, or manipulated the pigment with his fingers. For all his rebel posturing, Loos was extremely adept at exploiting his contacts. It was he who introduced Kokoschka to the Emperor's tailor, and also to one of the late Empress's former readers. Many of the portrait sitters whom he inveigled were extremely well-connected, famous if not rich. Loos also succeeded in getting Kokoschka a foothold in Germany by arranging for him to collaborate with Herwarth Walden, founder of the avant-garde Berlin periodical Der Sturm. Kokoschka, who joined the Sturm staff and moved to Berlin in May 1910, became far more widely known through the drawings and writings that Walden published. Loos pressured Walden to establish a connection with Germany's foremost art dealer, Paul Cassirer, who gave Kokoschka his first German exhibition later that same year. An exhibition at the prestigious Folkwang Museum (also the first museum to acquire Kokoschka's work) followed shortly thereafter. In early 1911, Kokoschka returned to Vienna, where his paintings were included in a group show at the Hagenbund, an artists' exhibition society. He was to remain there until the outbreak of the First World War, despite the fact that (more or less for the first time) his work really was the brunt of concerted attacks. This is not entirely surprising, for the Hagenbund exhibition was the first extensive Viennese showing of the artist's more Expressionistic paintings, and neither the public nor the press was particularly pleased. No less a personage than Arthur Roessler, an avant-garde critic who championed Egon Schiele, called Kokoschka's creations "massacres in paint." Kokoschka had also written a drama, Shauspiel (Play), which was banned in rehearsals by government censors because it was deemed "offensive to public morals." A contract to teach at the Kunstgewerbeschule, arranged in 1912, was allowed to lapse in its second year. When Kokoschka obtained a teaching post at Eugenie Schwarzwald's progressive girls' school (which was partially designed by Loos), the Board of Government School Inspectors rose up in indignant fear of potential moral indiscretions and forbade Kokoschka from teaching altogether. Such, Kokoschka learned, was the price of being an "Oberwildling," and in certain respects the pain would remain with him all his life. It was during these deceptively placid years immediately preceding the outbreak of World War I that Kokoschka pursued his much-scrutinized affair with Alma Mahler--another ultimately painful experience that was to remain with him for decades to come. Alma Mahler, widow of the composer Gustav Mahler, was one of the fabled femme fatales of her era, whose conquests included such luminaries as Klimt, Alexander Zemlinsky, Walter Gropius and Franz Werfel. The relationship was Oskar's first serious sustained passion, but Alma from the start endeavored to preserve her distance. She insisted on keeping the affair secret and when, in 1912 and 1913, the two traveled together to Switzerland, the Tyrol and Italy, she always booked separate rooms. Most devastating to the young artist, she aborted their child rather than marry. In the telling, it often appears that Kokoschka joined the army in the aftermath of his break with Alma Mahler, but in fact Alma seems to have let him down gradually, even after rekindling a prior affair with Gropius, whom she married in mid-1915. Kokoschka's eagerness to enlist may seem surprising in the light of his later pacifism, but at the time almost none of his friends opposed the war. It is indicative of Kokoschka's smoldering ambition that he also managed to gain admittance--again with the connivance of Loos--to the most elite cavalry regiment. Loos (much to Kokoschka's embarrassment) even had postcards printed up depicting the artist in his elegant uniform and pointed helmet. Though initially uncomfortable with the aristocrats who dominated his regiment, Kokoschka was a dedicated soldier and rapidly advanced to the rank of officer. However, for Kokoschka, as for many of his comrades, the glories of an idealized war faded quickly before the grim realities of the battlefield. Shot in the head and pierced through the lung, he was left for dead on the Russian Front. A period of convalescence in Vienna followed, but Kokoschka, at his own request, was soon sent back to the Front. Although in a noncombatant position (like many artists, he was re-assigned to the War Press Office), Kokoschka returned from his second tour of duty suffering from severe shell shock and more or less unfit for further service. In 1916, Kokoschka went to Germany for medical treatment, eventually settling in Dresden with the intention of lobbying for a teaching post at the Academy there. He managed to stay out of the military fray until the end of the war, and in 1919 the coveted professorship finally came through. Kokoschka's sojourn in Dresden was recuperative in ways more than physical, for he was still suffering from the after-effects of Alma Mahler's rejection. The emotional healing process was effected through one of the more bizarre episodes in the artist's quirky biography: he commissioned a life-sized doll in the likeness of his former lover, complete (as he made special point of emphasizing) down to the most intimate details. In his abortive attempt to form a real "relationship" with the doll (which he took to restaurants and used as a model), Kokoschka underwent his closest brush with true insanity, but here, as in all such previous incidents, there was also an element of self-conscious posturing. Kokoschka was undoubtedly no less pleased with his new epithet, "Der tolle Kokoschka" (Mad Kokoschka), than he had been with his former title of "Oberwildling." By 1920, Kokoschka had experienced a decade of intermittent exposure to German Expressionism, and he proved adept at absorbing the congenial aspects of the style. Already before the war he had turned away from the primitive, scraped surfaces of his earliest paintings to a richer, more buttery impasto. His palette--from the start rather subdued--grew even darker in the wake of his exposure to El Greco (then undergoing something of a revival) and the Italians Titian and Tintoretto, whom he had seen on his travels with Alma Mahler. One detects in some works from this period an ersatz Cubism that may have been filtered through Lyonel Feininger. Kokoschka's broad, painterly fragmentation of form also suggests the influence of E.L. Kirchner and, particularly in the bluish palette that predominates from 1913 to 1916, that of Ludwig Meidner. Kokoschka's "Germanization" was consummated in Dresden, where he first embraced the bright, fauvistic hues so popular among many German Expressionists before the war. The expansion of Kokoschka's palette during the Dresden period provided the key missing piece he had been searching for. To his visionary acuity, seismographic line, and dexterous feeling for paint texture he now added the crucial element of color. Though certainly not an indifferent colorist formerly, he was brilliant hereafter. The stylistic amalgam was completed shortly after Kokoschka left Dresden in 1923. Following the death of his father, he spent about a year in Vienna and then began a period of protracted travel. With generous funding from his Berlin dealer, Cassirer, Kokoschka in the ensuing decade visited no fewer than eleven European countries, plus North Africa and the Middle East. In the numerous landscapes that resulted from this journey, he perfected the style that was (with slight modifications) to remain with him for the rest of his career. Painting outdoors or from his hotel balcony, and constantly racing the changeable light and weather, Kokoschka developed a rapid shorthand approach that combined the spontaneity of watercolor technique with the complex paint densities possible only in oil. Given his newly masterful command of color, he was able to penetrate to the inner core of his subject while still obtaining objective clarity. During this period, Kokoschka's reputation in Germany expanded dramatically, and the artist (to the disgruntlement of some of his German colleagues) was even invited to represent that country at the 1922 Venice Biennale. Yet as indicated by his peripatetic wandering, he always felt in some ways rootless. This sense of homelessness, which originated with the demise of the Austrian Empire in 1918, grew only worse with the political events of the 1930s and 1940s. Kokoschka was driven from Dresden in part by the instability of the Weimar Republic, and, in 1934, he sought refuge in Prague (for Czechoslovakia was virtually the only prosperous nation among the defeated lands of World War I). In Germany, he saw his work branded "degenerate" by Hitler and featured prominently in the 1937 exhibition of that name. Following Hitler's invasion of Austria in 1938, the future of Czechoslovakia was compromised, and later that year Kokoschka emigrated to England with a young Czech law student, Olda Palkovská, whom he married in 1941. The Kokoschkas remained in Britain throughout the war years, but ultimately settled in the Swiss town of Villeneuve. The artist's reputation again flourished in postwar Germany, where he became something of a "court painter" to a generation of politicians eager to disassociate themselves from the Nazi past by commissioning portraits from a "degenerate" artist. Nevertheless, Kokoschka could not shake the sense of being constantly under attack, instilled in him from his early days with Adolf Loos. Even in Germany, he was not accorded proper respect as the "inventor" of Expressionism, and on the international scene he felt swept aside by the rising tide of abstraction, a style he could neither understand nor condone. Kokoschka died a week shy of his 94th birthday in 1980, the last of his generation and an inveterate outsider. He had worn the outcast's mask too long, and in the end could not remove it.